I get daily emails from Real Simple (Which I would highly recommend for everyone! They are so great!) Yesterday’s email was about their new Makeover Tool. I have tried several other tools in the past, but this one is spot on! It takes a little bit to find a good photo and create the settings, but once you do that, the possibilities are endless! The Makeover Tool helps you try new hairstyles, makeup colors, and hair colors. Would you buy a car before test driving it? No. So why not test drive your new look before making that expensive salon appointment. Plus, it is fun! I spent a good hour yesterday exploring numerous possibilities. I haven’t found a perfect option yet, but I always have been one to avoid change. 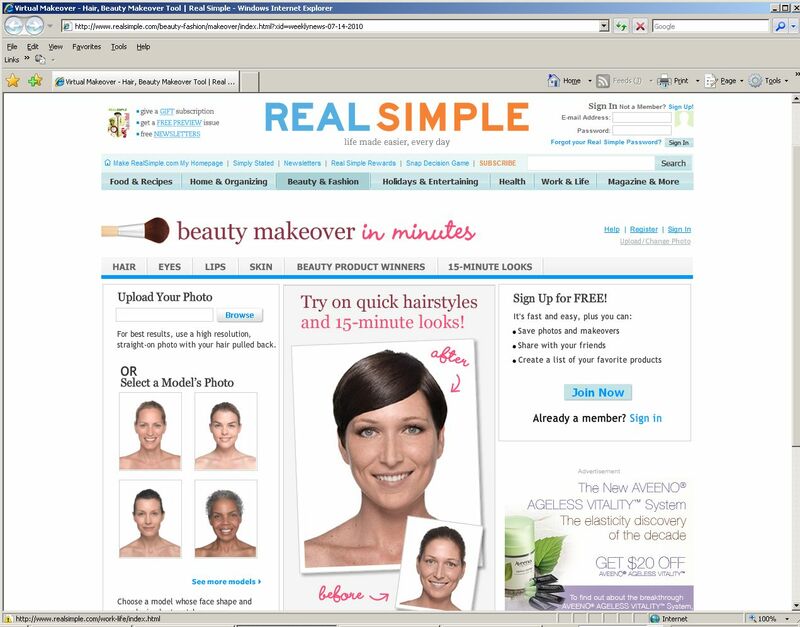 Check it out at http://www.realsimple.com/beauty-fashion/makeover/index.html?xid=weeklynews-07-14-2010.